One of the biggest problems in hydroponic research is the measuring of individual ion levels in hydroponic solutions. Right now there is no commercial solution for the accurate tracking of individual ions in hydroponic solutions and this makes it impossible to track ions in real-time to measure how nutrient absorption reacts to different environmental and chemical conditions. The only way to currently do this is to carry out more expensive and cumbersome ICPE analysis that provides a snap shot of a solution's composition in time. However there is a solution that might be coming up within the next few years which is the use of electronic tongues to measure the concentration of a large variety of ions in solution. Many of you may be thinking, what about Ion Selective Electrodes (ISEs) ? These electrodes are designed to measure the concentration of individual ions in solution and they are perfect when you're trying to measure a single ion against an unchanging background. The issue with ISE is that they work via the interaction of ions with molecules that have a especially strong interaction with them (what we can an ionophore) but the interaction can also be strong with other ions, generating interference. For example a K+ ion selective electrode usually uses an ionophore like vancomycin but this ionophore also has strong interactions with NH4+ (ammonium) ions. 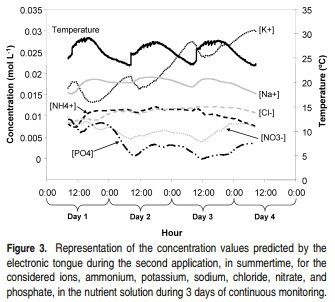 Since the concentration of ammonium also changes with time in hydroponics this means that your reading will be changed not only by how K+ concentration varies in solution but also by how NH4+ concentration changes. In reality interference is not generated by a single ion but by a good portion of the ions present in a hydroponic solution. This means that it is practically impossible to use an ISE in an accurate manner in hydroponics because you will always be getting changing interference from the other ions in solution. In the experiments I have done attempting to track nutrients using ISE this problem has always been so bad that the results become practically useless, regardless of how you calibrate the electrodes (since the concentration of the ions that interfere changes relative to the ion you want to monitor). Electronic tongues are an intelligent idea to circumvent these problems. The idea is to use many ISE for different ions - with many for the same ion and many generic ionophores that have poor selectivity - and then to use statistical modeling tools - mainly neural networks - to come up with ways to figure out the noise/signal/interference and get accurate measurements for ion concentrations regardless of what the actual readings of the electrodes are. 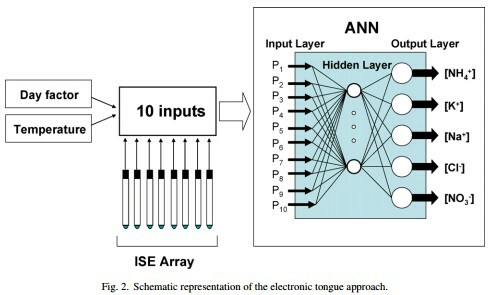 The neural network is trained with data from solutions with varying concentrations of all the ions being monitored and this allows the creation of a robust prediction engine that can be used to get actual ion concentrations. M. del Valle's group in Barcelona has done some of the pioneering work in this area, the images in this post have been taken from some of their research papers on the subject (for example this one and this one). 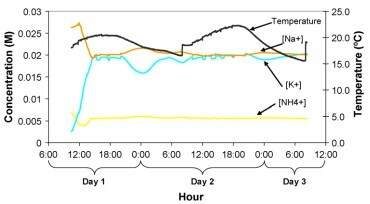 Through this research they have been able to come up with ISE arrays that - using the neural network models - can measure concentrations in real-time for nitrate, chloride, sodium, potassium, ammonium, calcium, magnesium and phosphate. This means that you can effectively monitor how plants absorb different ions, not only allowing you to carry out experiments surrounding nutrient absorption but also allowing you to know which ions are getting depleted so that you can replace them. This brings a totally new dimension into hydroponic culture that simply isn't accessible right now. It might take a significant time for these sensors to reach commercial applications - mainly due to the expensive calibration that is needed due to the variability in fabrication - so it might be years before we see something like this available to the general public. However if you have a commercial hydroponic setup that is large enough you definitely can follow this research to make your own ISE array and build an electronic tongue with them. This will give you access to a ton of information that is inaccessible to all of your competition. Hi Marine, Thanks for writing :o) I just replied to your contact email, Best Regards, Dr. Daniel Fernandez Ph.D.